You know all those awesome new gadgets and gizmos you accumulated this past holiday season? They need memory cards and today is the day to buy them. 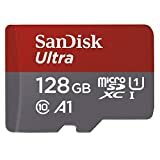 Amazon is currently offering SanDisk Ultra 128GB microSDXC UHS-I cards for just $21.99 each, and they’re easily the most popular microSD cards out there. Other capacities are available at great prices as well right now, so definitely take advantage of this deal.